Based off my old Mini and miniPlus themes, and somewhat inspired by my new car's dashboard (red on chrome). 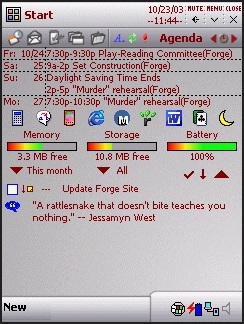 Zip archive contains skins for Dashboard, WISBar/WisBar Advanced (plus a volume icon for icbar compatibiliity), and Facelift-compatible full screen Today theme. this is a worthy successor to mini-plus. love all that data room! I want the old Mini and Mini+ skins updated for WisB Adv! I loved that purple one... and the cherry one, too! Used 'em forever.